Yesterday was the Mohican Christmas Bird Count, and I went along for the ride. Our 15-mile diameter circle encompasses some of the most beautiful terrain in the central Ohio area, with the centerpiece being Mohican State Forest. Many good birds were found, and at our lunchtime get-together, 76 species were reported with nearly all teams checking in. I'd think the count broke 80, but I haven't yet heard a final tally. Noteworthy and exciting were White-winged Crossbills, the biggest celebrity among this year's crop of winter finches. Twenty of them flew over our heads at lunch, and small roving flocks were seen elsewhere for a couple dozen birds in all. Mohican State Forest, view from the top of the fire tower. I'm really glad that they've fixed this structure up and allow the intrepid to climb to the top. A commanding vista can be had, and in this photo we're looking in the direction of the Clear Fork Gorge - the heart of this 5,000-acre forest. After hearing a report from Robert Hershberger's team that some cooperative White-winged Crossbills (henceforth WWXB) were seen at the gorge overlook, we headed there right after lunch. My team members Cheryl Harner and Marc Nolls pose next to the Eastern Hemlock, Tsuga canadensis, that was the site of great WWXB revelry only minutes before. A gang of two dozen descended on this tree and staged quite a show, twittering, seed-eating, clambering about like little parrots, and engaging in the odd brief tussle. All of the green trees in the backdrop are hemlock, which is abundant in the gorge. Tons of crossbill fodder here. Two males, resplendent in coats of salmon-pink set off by bold white wing bars, search the hemlock for booty. Most of the time, the pack members feverishly destroyed cones, seeking the tiny seeds that fire their engines. Allegedly, a motivated crossbill at full tilt can consume 3,000 conifer seeds in a hard day's work. That means that this pack must have taken several hundred seeds from this hemlock in their short visit. I had a hard time managing any real great shots due to the light, so I borrowed one of Dr. Bernie Master's wonderful efforts from earlier this month. His shot shows a female cracking into some ripe hemlock cones. Pay attention to the cone she is dissecting, and the one in the middle of the two behind her. Mmmm - very good! Note how the scales are separating and spreading outward, indicating ripe fruit and easy pickings. The other two cones still have the scales tightly appressed, indicating a higher moisture content and probably seeds that are not quite ripe. Plus, these greener cones are probably a heck of a lot harder to get into. I suspect crossbills instantly and accurately size up the ripeness of a cone crop as soon as they alight. Eastern Hemlock cones are tiny and delicate - well-suited for the rather small bills of WWXB's. Note that the foliage of this species of hemlock has two conspicuous white lines running the length of the leaves on the underside, a good identification characteristic. These cones are not fully mature and would likely be shunned by foraging crossbills, I suspect. Here I've largely simulated what a crossbill does much faster and more efficiently than I could hope to. These are the cone scales, which must be removed to access the seed, which is what they are after. You can see a seed in the scale on the far right, near the base. Feeding WWXB's are often remarkably quiet, only emitting soft twitters. Sometimes all one hears, if they listen closely, are the cracking sounds of cones being violated, accompanied by the sight of little brown scales fluttering softly earthward. Once the flock takes to the air, they don't shut up, though. Eastern Hemlock seeds, separated from the chaff. It can take as many as 70,000 of them to make a pound. 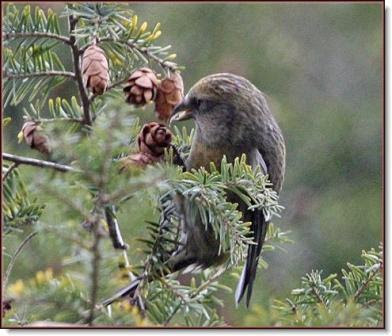 When the small size of the prey is known, one can understand why crossbills have become so efficient at withdrawing the seeds from the cones. If it is true that an industrious WWXB can eat 3,000 of these in one day, it might take the bird over three weeks to consume a pound. Of course, a pound of hemlock seed would make quite a pile. An example of the disparity in cones among different conifers. The tiny cones up top are from the hemlock, and the whoppers are those of Colorado Blue Spruce, Picea pungens. There are several dozen native conifers in North America, and shapes and sizes of cones vary tremendously. It is not hard to see why Red Crossbills, which typically manage cone sizes larger than those preferred by WWXB, are actively evolving different bill morphology to better exploit different species of cones. Why aren't White-winged Crossbills in a similar evolutionary race? I don't know. November 19th was a great day to be birding along the cold, blustery Lake Erie shoreline in the Cleveland region. Massive packs of Red-breasted Mergansers created the appearance of low-lying, fast-moving storm clouds scudding just above the horizon. Bouyant squeaking buzzy throngs of Bonaparte's Gulls swirled in the harbors, members of the gang stooping occasionally to deftly snag an emerald shiner or some other piscine treat. Among their ranks we spotted a rarity: Little Gull, jumping out from afar due to its sooty charcoal underwings. And there were other great finds. Pomarine Jaeger, a falcon of the gull world and inveterate kleptoparasite, riling the Laridians to no end when it enters the scene. Two insanely tame Purple Sandpipers, bumbling about icy, moss-cloaked limestone boulders of riprap, literally at our feet. Both Black and Surf Scoters, bulbous-billed clam-crackers, a small flock of which moored themselves over a zebra mussel encrusted reef. Above the scoters, in a backyard on the bluff, was an entirely unexpected Eastern Phoebe. Of course, the day started auspicuously enough when a Red Crossbill flew directly over my head as I waited for birding companions in the parking lot of Mentor Headlands. But it's the Rock Pigeon I want to mention. I like them. Thus, when we stopped in at Cleveland's Edgewater Park, hoping for a grass-grazing Brant, I was delighted by the perk of fantastic pigeon photo ops. There they were, intermixed by the dozen with scads of Ring-billed Gulls, hoping for a handout. And many Edgewater visitors oblige them, but not me. I just shot photos of the beautiful birds in all their crazy color variations. Pigeons are much-maligned, but are not really worthy recipients of our abuse. Sure, they aren't native, but we brought them here. And unlike House Sparrows or European Starlings, they do very little in terms of causing ecological damage or harming native birds. Large congregations can damage man-made property and occasionally be vectors of disease, but you know what they say about paybacks. Look at all of the cool color variations in this mob. The pigeons with smooth gray bodies, two dark wingbars, and a dark head are the classic wild phenotype, known as blue-bars. But people have been fooling with pigeons for a long time, crossing them to produce other color forms, leading to a wild hodgepodge of forms. Dead center in the above photo is a gorgeous piebald bird, and others show dominant cinnamons, blacks, varied whites, and grays in a dazzlingly mad varied array. Rock Pigeons have served science well. By conducting endocrinology studies with pigeons, the pituitary hormone prolactin was discovered. Scads of studies have been conducted on their flight mechanics, orientation, and color genetics. The literature spawned by the lowly pigeon could fill a small library, probably. If I was to be a bird, I would have to give the Rock Pigeon some consideration. Mainly for their fantastic aerial prowess. If you've not done so, watch a flock on the wing sometime. Coursing high above the city, they meld together as one, performing elegant high-speed jigs and jags, flowing through the sky with a grace that few other birds manage. Breeders have honed these flying skills, creating amazingly adept aerialists such as the "rollers". CLICK HERE to watch the wacky antics of this form. I GUARANTEE you will be impressed. Pigeon fanciers have long recognized the superb aeronautics of pigeons, and for centuries have raised birds for the joy of flying them. Keeping pigeons was, and probably still is, popular in the most urban of buroughs, like Brooklyn, NY. Fancy coops were kept on the rooftops high above city streets, and the pigeons were regularly liberated to course far and wide over the concrete jungles, the coteries always returning to their lofts. Stunning blue-bar. What's not to like? If he were as rare as, say, a Pomarine Jaeger or Purple Sandpiper, we'd all be flabbergasted at the sight of this pigeon. Many an ooh and awe would be exchanged amongst the birders as we commented over the elegant grays tinged with coppery purples, the beautifully robust shape, and the waxy-white ceres. One last commentary on the pigeons' contribution to mankind; one that is not so well known. In the heat of World Wars I and II (and previous conflicts), prompt passage of intelligence between frontline fighting and Allied command behind the lines was problematic. Electronic communications were nowhere near as advanced as today, and it was quickly discovered that radio messages could easily be intercepted. Enter the pigeon. "War Pigeons" were widely used as messengers, transporting documents over and through some of the fiercest fighting. Tiny scrolls or microfilm were attached to the pigeons' legs, and off they were sent to deliver intelligence to the commanders. The UK alone deployed some quarter-million pigeons during WW II, and some of these birds were awarded medals of valor. Rightly so; they faced grave danger. Many were shot from the sky, as the enemy knew what their mission was. For a while, the Germans sicced trained Peregrine Falcons on soldier-pigeons. This ploy was abandoned as it was soon realized that the falcons failed to distinguish between German pigeons (they used them, too) and those of the other side. Probably the most famous of all the carrier pigeons was one named Cher Ami, two French words meaning "Dear Friend". Cher Ami spent several months on the front lines during the Fall of 1918. He flew 12 important missions to deliver messages. Perhaps the most important was the message he carried on October 4, 1918. "We are along the road parallel to 276.4. "Our own artillery is dropping a barrage directly on us. "For heaven's sake, stop it." Back in the United States the story of Cher Ami was told again and again. The little bird was in the newspapers, magazines, and it seemed that everyone knew his name. He became one of the most famous heroes of World War I. So, next time you have the opportunity to admire a pigeon, or better yet, a group of them, consider what they've done for us. Not too many species of birds can lay claim to the important contributions to humankind that pigeons have made. Today, I saw the startling orange and black blaze of Lord Baltimore's colors in the form of this gorgeous Neotropical blackbird. The date is December 21, the temperature was hovering around 25, and Arctic blasts of frigid air made conditions seem far colder than that. And there was the gorgeous adult male Baltimore Oriole, busily cramming bits of frozen pineapple, suet, and other assorted fare into its gaping maw at the feeders of Becky Schmitt, in Worthington, Ohio. A far cry from where most of this oriole's brethren are right now. Not a typical sight for late December in Ohio, but by no means unprecedented. This is at least the 30th winter record for Baltimore Oriole. Yep, these are the tough guys. They don't need no pina coladas by the pool in sunny tropical Costa Rica, whiling away the winter in chaise lounges. And I still hope this oriole feels that way after tonight, when low temperatures will dip to 7 degrees. Becky provides an ambitious culinary palette for orioles of discerning tastes. Here, our guy samples the Chunked Pineapple in Cage. He like. After that, the second course was Suet with Mixed Seed Imbedded, and for dessert it was on to Sunflowers Lightly Crisped and Dry. Let's hope this diet supercharges the oriole for some extremely frosty nights ahead. A real showstopper by any standard. Incredibly, Becky had a first-year male visiting these same feeders last winter, and I would think that this is the same bird all grown up. If so, a real glutton for punishment, this one. Adult male Baltimore Oriole, on the grounds of the Buena Vista Hotel in San Jose, Costa Rica, February 1st, 2008. I couldn't resist snapping this photo of one of "our" birds down on its tropical wintering haunts. I am not going to show this blog to Becky's oriole, as it would not be kind. Especially with the upcoming temperatures that he is going to experience. I hope he does well, and thanks to Becky for bringing this great find to light, and taking such good care of him! The above species are not normally considered in the same sentence, at least hereabouts, but I saw both today. It was the Beaver Christmas Bird Count today - 18th year, I believe - which takes place around Jackson, Ohio, in parts of Jackson and Pike counties and has ably been compiled by Tom Bain since its inception. I do a section just north of Jackson, and it is very rural and full of interesting habitats. Today, Edie Miller was along and we had plenty of good birds. Driving by a small creek in a rather scruffy area, I heard the distinctive chip of an Eastern Phoebe, and we stopped to track the bird down. These are by far our hardiest flycatchers, and regularly persist well into December in southern Ohio if conditions remain even halfway moderate. They'll even attempt to overwinter if possible. McCune Cemetery, a small burial ground carved out high on an isolated oak ridgetop. Such cemeteries are often full of interesting and valuable native plants, and that means more birds, as we shall see. We were delighted to see not one, but three Pine Warblers in the cemetery. This is one tough warbler and overwinters regularly in southern Ohio - probably the northern limits of its consistent winter range in this region. Pine Warblers are probably our only warbler that consistently includes seeds as a dietary staple. And I noticed that one of the dominant plants in the cemetery was a panic grass (Dicanthelium). These native grasses are an enormous source of seeds for songbirds, and that's what the Pine Warblers were feeding upon. So were Eastern Bluebirds. A flurry of about two dozen roared into the cemetery, and spent most of ther time on the ground wolfing down panic grass seeds. The male above is rather odd, and caught my eye. The chestnut of the breast extended around his neck, forming a beautiful collar. Might remind one of a Western Bluebird. But he's got the nice chestnut throat of an Eastern, along with all of the other characters. On my way home, I stopped at the massive Charlie's Pond grasslands. Details and directions can be found here. There were Northern Harriers galore, and this beautiful Short-eared Owl popped up on this sign and posed. One other owl was flapping about, and I'm sure there are more. This is a great spot to visit in the winter, if you are into raptor admiration. Excuse the less than stellar shot, but it was nearly dark when I took this. There are something like 18 Ring-necked Pheasants visible in this photo, and at one point I could count 36 at one time. All told, I saw at least 50 in the area. While some may dismiss ring-necks as non-native and inconsequential, they are incredibly beautiful, especially the roosters. And pheasants are often a driving force to stimulate the creation or restoration of grasslands, and that benefits lots of native species, like the Short-eared Owl. A perennial and favorite topic, whenever serious birders band together, is the NEXT GREAT BIRD. Such chatter reaches the level of a psychosis, really. We all fervently dream of the NEXT BIG ONE, and of course, secretly or not so secretly hope that we are the ones to find it. Rarely happens, though. Once in a while it does, and most of us who have been peeking through the bins long enough have some cool find or finds to claim. But the one depicted below MAY be the most coveted AYTBSUTMRTITLACORB (as yet to be seen ultra-thrilling mega-rarity that inflames the listserv and cements one's rep bird) for Ohio birders. We're due, and it'll happen eventually. They've been seen everywhere else in the Midwest, it seems. I know it's first on my list of rub the bottle genie pops out and grants any wish bird. 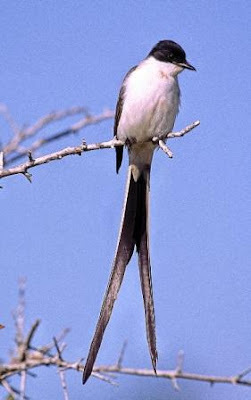 Fork-tailed Flycatcher, Tyrannus savana. It occurs widely in Central and South America, but wanders regularly far to the north. One or at best a few might appear in the States each year, generating lots of excitement. Not only is it rare here, but just have a look at the thing! Who wouldn't want to see this! This photo kindly provided by Gary Meszaros, one of the country's top nature photographers. Gary resides near Cleveland, but just picked off the Fork-tail on a recent Florida trip. The streamer-tailed beauty was at Pelican Island National Wildlife Refuge, and even made the press. Allegedly this was Roger Tory Peterson's last North American lifer. Speaking of Gary Meszaros, be sure and check out his galleries of work. He's got some of the finest natural history photos, anywhere. 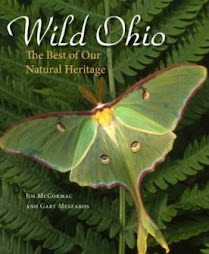 I'm flattered that he agreed to collaborate with me on a book featuring the very best of Ohio's remaining natural areas. It should be out early this spring. Quick Fork-tailed Flycatcher story. 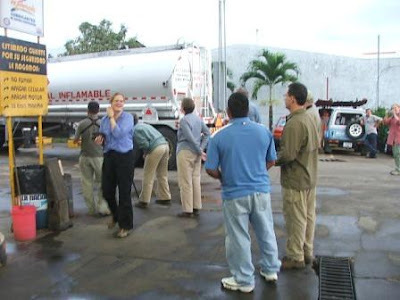 Gas station in San Isidro, Costa Rica, where our birding group had stopped to refuel on a February 2006 trip. Most of the folks are with our group, and the woman in the blue shirt, facing the camera, and giddily stamping about is Jen Sauter. Why? Because we had just seen a Fork-tail! I had gotten out to stretch, and saw the bird on a distant snag, so we all roared out of the van, and set up a scope right in the parking lot. Not being overly bashful about sharing thrilling birds, we soon had most of the locals present, including the driver of that big rig, queued up for looks at the bird through the scope. They, too, seemed thrilled. Birds like this are great ambassadors for the feathered crowd. I was afield today, helping find birds as part of the annual Columbus Christmas Bird Count. The south side of town is my domain, and I get into some spots that I normally don't frequent. The above is one of them. We are looking west down Hart Rd., which runs off of Harmon Avenue. This year, the extreme fruit production of the Amur Honeysuckle, Lonicera maackii, really caught my eye. That's what all of those shrubs lining the roadway are, and so copiously loaded with berries are they that their collective masses created a reddish bloom to the shrubscape. A closeup view of Amur Honeysuckle berries. Kind of showy, I suppose, and you can see why misguided landscapers might wish to grow it. But like The Blob, bush honeysuckle has gotten totally out of hand and now ravages the landscape. In a season of plentiful fruit, like this one, there must be literally millions of berries on bushes in Franklin County alone! And those berries are bad news, as we shall see. But so is the physical structure and density of the shrubs themselves. So prolific are the honeysuckle that it utterly displaces native flora in many areas. Some think that the plant is also allelopathic; that is, it produces enzymes from the roots that inhibit the growth of other plants. I am a believer in the allelopathic theory, as the understory of a honeysuckle thicket is mostly barren earth. In native stands of shrubs, such as Spicebush, Lindera benzoin, one finds many other native plants. The massive underground root systems of large honeysuckle stands also drain moisture from the soil, drying the habitat and making it even more inhospitable for the plants that should be there. The structure of honeysuckle shrubs does not lend itself to successful nesting, either. Studies have shown that the open habit of the shrubs offer less concealment to predators, and once a nest has been spotted, it is easier for predatory animals to climb and pillage. There were hundreds of American Robins along Hart Road, feasting on the honeysuckle fruit. I caught some in the act, such as this female robin. Nearly everywhere I went today, robins were in evidence, feasting on this nasty invasive. So were lots of White-throated Sparrows. Interestingly, the few Cedar Waxwings that I found were eating the fruit of a native tree, Hackberry, Celtis occidentalis. But in general waxwings prefer feeding higher off the ground, while white-throats and robins occupy niches on or near the ground. That's not to say waxwings won't eat this stuff, because they will. Beautiful male American Robin, scarfing down oodles of berries. Ironically, native birds like robins are major vectors in the spread of invasive honeysuckles, and other non-native berry producing plants. But just like the native flora displaced by the honeysuckle, these birds too can pay a price. And now to the M & M analogy. Honeysuckle fruit certainly look good, and judging by the way the hordes of robins wolf them down, they must be tasty. Had I had my choice between eating bags of M & M's as a kid, or spinach, liver, and broccoli, it would have been the little round confections every time. And my health would have suffered greatly for it. Same with the birds. The honeysuckle fruit are primarily mostly made up of carbohydrates, and lack the important fats and nutrients that are often abundant in native shrub and tree fruit. So, this artificial bounty of berries entices huge numbers of robins and some other species to winter well north of where they normally would. All may be fine, until they got socked with a spell of brutal winter weather, with extended subzero temps, frozen ground, and ice. Then, the energy provided by honeysuckle is quickly depleted and mortality spikes sharply. We saw this here in Columbus a few winters back, when a severe winter storm triggered the death of probably thousands of robins. The web of ecological consequences spawned by invaders such as bush honeysuckle is often far-reaching and insidious, and generally not foreseen when these invasives are first touted as landscaping gems. Do the world a favor - destroy a bush honeysuckle! I've long been infatuated with ducks. Even as an elementary school lad, I would pore over the accounts of sea ducks in the books and references that I had, trying to learn more about them. To me, growing up in landlocked Columbus, Ohio, birds like scoters and eiders had an exotic and wild aura, and I would even attempt to sketch them in what I imagined their cold coastal Atlantic haunts must look like. And to this day, the diving ducks remain amongst my favorite groups of birds. About two years ago, I was invited to speak at the Canton Audubon Society's annual Christmas Holiday meeting, which featured a raffle. I was instantly struck by two of the raffle items: a pair of beautifully carved and finished Long-tailed Duck decoys, one a male in alternate (breeding) plumage, and the other a drake in winter plumage. I found out that they were the handiwork of longtime birders Laura and Tim Dornan, and at the time I had no idea that they were carvers. Tim sculpts the birds from a block of wood, and Laura brings them further to life with her painting. Of course, I bought some raffle tickets, hoping to snag one of the Long-tailed Ducks, and promptly lost. However, I was able to strike a deal later with the winner of the winter-plumaged Long-tail, and am now the proud owner. Gorgeous drake Long-tailed Duck, once known by the more colorful if less visually descriptive name of Oldsquaw. The tail streamers on this decoy are made of metal for durability's sake, but blend seamlessly into the body of the bird. It is resting on an elevated stand, as the bottom of the decoy sports a keel, which would permit it to float correctly in the surf. But this bird will not be seeing any water, at least under my ownership. Long-tailed Ducks are interesting in that both sexes have an alternate and a basic plumage, just as do many songbirds. Drakes in their breeding coats are much blacker than the bird above. We don't see many Long-tails here in Ohio, but elsewhere on the Great Lakes flocks numbering into the thousands congregate. Excellent divers, Long-taileds have reportedly been caught in trawler nets up to 200 feet down! This was the first Dornan I specifically commissioned - a stunning drake Harlequin Duck, one of my favorite birds. The males are almost outlandish with their patterns of dots and dashes set against plumage of blue and cinnamon. The scientific name is Histrionicus histrionicus, which refers to a character of traditional Italian comedy and pantomime, the Harlequin. This actor wore a diamond-patterned outfit and performed tricks, or "histrionics". Birds of crashing surf and turbulent streams, Harlequins adeptly negotiate rough waters that are beyond the scope of most birds. Purple Sandpipers are regular winter associates - the sandpipers foraging on wave-washed breakwalls, and the ducks riding in the crashing surf just beyond. Apparently, it is not uncommon to find Harlequins Ducks with mended bone breaks and fractures, the result of life in perilous surf. Barrow's Goldeneye drake, my next Dornan commission. The blacker body and bold teardrop of white before the eye easily separate it from the Common Goldeneye. This species nests in cavities, and often frequents swift rivers and streams. It is quite the rarity in Ohio, with but seven or so records, all of them from Lake Erie. The last report dates to 1994, and we are probably due another soon. I've got some good vibes about Barrow's Goldeneye, and am hopeful that one will appear this January or February, probably at Eastlake Power Plant or Avon Lake Power Plant. Hey, one can only hope for the best, and a cooperative Barrow's Goldeneye in Ohio would be a state bird for most of us. Drake Surf Scoter, which I just received this week. Love it. Scoters are cool, and will always rank high among my favorite ducks. Adult male Surf Scoters are sometimes known as "Skunkheads" due to the striking pattern of bold white splotches. Look at the bill on this thing! That's a clam-cracker, to be sure, and scoters feed heavily on molluscs so a strong sturdy bill is a real asset. The scientific name is Melanitta perspicillata, and the latter epithet means "spectacular", and refers to the colorful bulbous bill. Note the hefty keel on this decoy, which is heavily weighted with a lead strip. Tim researches the work of other carvers and their work, and replicates working birds. Surf Scoters often inhabit rough waters, and the weighty keel is necessary to keep the decoy in good trim as it rides in the surf. Scoters, especially Surf and Black, have become more frequent in the last decade plus along Lake Erie, no doubt capitalizing on all of the introduced Zebra and Quagga mussels, which didn't appear in Lake Erie until 1988. Here all of my Dornan-carved decoys, gracing a prominent perch in my office. I've asked Tim and Laura for a drake Black Scoter next, and it will look great with these other decoys. Who knows, if they'll keep working with me, maybe I'll eventually amass all of the sea ducks, then we can start on the hens of all these species! Thanks Tim and Laura. It's been cold around here. Cold enough to put a glassy veneer of ice across the surface of some of the local rivers and lakes. But that makes for excellent waterfowling, whenever one finds the open leads. And that I did the other day, at a nearby quarry. Open water patch, Watermark Quarry, and birds. Lots of birds. I absolutely love stumbling across mixed flocks of waterfowl. They are fun to pick through, and see who is who. And I just like watching ducks. This pack had seven species in its ranks, six of which are visible in this shot. I'll tell you the seventh right now: Lesser Scaup. See if you can recognize the others. Some, easy - some, not. At least in this shot. We'll quickly dissect the scene below. Miss this one, and we'll honk at you. Canada Goose. No brainer, but rendered slightly more problematic with the 2004 splitting of the species into two, with the micro-honkers now separated as Cackling Geese. Good cacklers aren't too tough - they are just about Mallard-sized - but problems do occasionally arise with Arctic-nesting "Interior" Canada Geese, which are noticably smaller than these "Giant" Canada Geese. With the onset of cackling fever following the split, and the allure of a new tick for the lists, some of the smaller subspecies of Canada Geese are once in a while mistakenly called Cackling Geese. Anyway, no ID problems with the big boys shown above. Nice white vertical slashes on these guys, eh? The dominant duck in this shot are Ring-necked Ducks. The drakes can be spotted a mile off by their distinctive patterns: mostly blackish with lighter gray sides, and that prominent white line just aft of the dark breast. Even the whitish ring around the bill stands out well from afar. Lovely beasts, these drake Ring-necks. American Coots, sometimes known as Mudhens, can easily be seen here, interspersed among the Ring-necked Ducks. A member of the rail family, coots utterly shun the secretive ways of most of their brethren. They are fond of large water bodies in migration, especially in fall and early winter. They can be recognized by their charcoal-gray bodies with darker blackish head, and chalky-white bill. They resemble little blackish floating blobs . Three Redhead, dead center. Two drakes, with a hen in front. From afar, Redhead drakes are not as black on the back as Ring-necked Ducks and lack the white slash. They have a more rounded head shape, and their noggin is of course a rusty-red color. They are also slightly bigger and noticably bulkier than Ring-necks. Weight is not taken into account often enough when considering bird ID. Sure, you can't visually weigh a bird from afar, but its poundage translates to bulk and the impression that it gives us. A Redhead weighs about one and a half times more than a Ring-necked Duck, and you can see their comparatively bulkier look in the above photo. Pair of Mallards, drake left and hen right, standing on the ice. Familiarity breeds recognition, and we all certainly know Mr. Mallard. The hen could be confused with a few other species, but note the obvious white tail, even visible at rest. That separates it from a hen Gadwall, which is the most likely source of confusion in this sort of habitat at this time of year. Plus most female Gadwall have some white secondaries although they can be concealed when the bird is at rest. Finally, here's a drake Gadwall, dead center, facing left. They are hardy and often occur in this sort of situation well into winter. The males are beautifully understated in shades of gray. With a good look, the vermiculation of their feathers is among the most ornate in the bird world. From afar, the male's black rump shows up well and clinches the ID. Note, too, how much more bouyant the Gadwall appears in comparison with the Ring-necked Ducks. Dabbling ducks float higher in the water, like corks, while diving ducks ride lower, like submarines that have surfaced. I hope to come across many more scenes like this over the winter. Hey, if you can't have warblers go for waterfowl! One of the great things about being involved with the Ohio Ornithological Society is the opportunity to work with a really great bunch of forward-thinking folks. While our primary work is here in Ohio, and that's where the bulk of our effort goes, every now and then the chance arises to do something beneficial beyond our borders. An OOS member, Randy Rogers, is a Major in the National Guard, and is currently deployed in Iraq. A one man tour de force, he hit the ground running over there, and has made incredible strides in getting fellow troops involved with birds and nature, as well as forging alliances with Iraqis with conservation being the initial common ground. Ann Oliver, our wonderful and talented Cerulean newsletter editor, took up Randy's cause with a passion, and has spread word of his efforts far and wide. Because of her efforts, the OOS has raised about $2000 to date to further Randy's work, with more to come. And Ann's hard work led to a wonderful article in today's Columbus Dispatch by Suzanne Hoholik that does a terrrific job of detailing Major Rogers and his work in Iraq. I've posted the main story below, but I encourage you to visit the Dispatch website to get the full color version with photos. JUST CLICK HERE. Copies of Randy's informative and photo-filled newsletters are also available there. Abundant thanks are due to Ann Oliver for her innovation and hard work, the entire board of the OOS for strongly supporting Randy's project, and to everyone who made donations or otherwise supported this effort. May a Masked Shrike land on your feeder, and may you never be cornered by a Honey Badger! "Today, I got a pencil sketch of some kind of gerbil I'm trying to look up," Rogers said in a recent interview. "I've had people bring me pictures -- usually they don't pick the plants. Once in a while, they bring me a sample in a container, or (hand me) rocks." Rogers, a Far West Side resident, publishes "Al Asad au Natural" every few weeks. He said he started the newsletter to answer questions he heard on base. What kind of tree is that? What is that blooming out there? What's this animal? What's living under my CHU (container housing unit)? The newsletter allows him to collectively answer questions, educate soldiers about their surroundings and, Rogers said, build morale among troops. "It seems to help the families feel closer to their deployed solders," he said. "I get a lot of positive feedback from the soldiers because they're curious about what they see around them." Rogers' newsletters are packed with information. There are features on Persian field mice, the golden jackal, the al-Asad oasis and the tamarisk tree. "The geology here is a little different; there's not a lot of fossils here," Rogers said. "But we still find things like flint." In every issue, there's some mention of or connection to Ohio. And there always is something on birds, Rogers' passion. In "Birders' Corner," a regular feature, he identifies an interesting species and provides background. He has recorded 70 species. "What surprises a lot of people is the diversity," he said. "Sometimes the people aren't paying attention to the nature around you." Rogers is not the first U.S. military member to write about nature in Iraq. After serving with the Connecticut National Guard in Iraq in 2004, Sgt. 1st Class Jonathan Trouern-Trend wrote the book Birding Babylon: A Soldi er ' s Journal from Iraq. Rogers, 42, became interested in birds when he bought his house in Columbus. He set up a bird feeder in his yard and began to record the species that showed up. He's at 57. He's done the same during a tour of duty in South Korea and during vacation and birding trips to places that include Japan, Mexico, England, Greece, Kuwait and Tanzania. He joined the National Guard in 1995. Before that, he served five years in the Army Reserve and four years on active duty. In Columbus, where he works full time for the Guard, he is a member of the Ohio Ornithological Society and volunteers at the Metro Parks. Some of the people he's met through both groups are on his mailing list. So are soldiers, some of whom send it along to their families. A number of people share it. He's received e-mails from readers as far-flung as New York and California. Angela Greene, a seventh-grade science teacher at Tecumseh Middle School in New Carlisle in Clark County, is an avid reader. She said the father of one of her students is based at al-Asad. 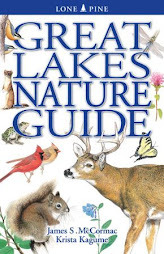 Greene teaches biodiversity and ecology, and she said the newsletters help her students compare nature in Ohio and Iraq. "We've been charting the different creatures he features and organisms he's writing about," she said. Members of the ornithological society are thrilled that Rogers publishes the newsletter. They say "Al-Asad au Natural" gets soldiers interested in nature and helps Americans better understand Iraq's natural history. "His personal mission of building bridges between us and Iraqi birders hopefully will bear wonderful, sweet fruit," said Ann Oliver, a Cincinnati resident and a member of the ornithological society. "He is a birding army of one." But he has help. Rogers is working with Nature Iraq, a nongovernmental agency that is working to restore and protect Iraq's environment. The group's officials praise the newsletters and distribute them to young people who work with them. They plan to put the newsletters up on the group's Web site. "Maybe someday in the future, Randel's articles (will) become very important," Mudhafar Salim, an ornithologist with Nature Iraq, wrote in an e-mail. Other Nature Iraq officials say that Rogers' newsletters give Americans a glimpse of the real Iraq, not the isolated areas torn by years of warfare. "People are surprised to know that we have snow-covered mountains and a wetland larger than the Florida Everglades," Azzam Alwash, executive director of Nature Iraq, wrote in an e-mail. In January, Rogers plans to go out on a birding survey with Nature Iraq officials in Iraq's northern Kurdish area. And although his tour ends in April, he has applied for a job that would keep him there until February 2010. He said there is a lot left to study. To help, the Ohio Ornithological Society is raising money to buy cameras, binoculars and books on birds, plants, trees and flowers for Nature Iraq so the group can continue its work to restore the nation's environment. The Ohio group has raised about $2,000. Being able to see Iraq as a place just like the United States -- with birds, plants, animals and insects, rather than a battleground -- helps people halfway across the world connect to Iraqis. These "are the great equalizer because people can identify with them," said Jim McCormac, president of the ornithological society and a state avian expert with the Ohio Division of Wildlife. "It humanizes the environment a lot more because Iraq's a wonderful place from a natural-history perspective." Donations can be mailed to Ohio Ornithological Society, Randy Rogers' Iraq Project, P.O. Box 14051, Columbus, 43214. 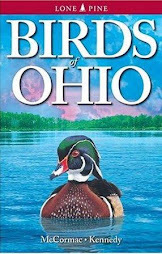 The group's Web site is www.ohiobirds.org. My lucky day. I stepped out of the beautiful chapel at Green Lawn Cemetery about 10 am this morning, after a meeting of our Board of Trustees. In a manner common to birders worldwide - convergent evolution, I suppose - I immediately did a quick once-over of the landscape. And there, not too distant, was a Merlin teed up prominently at the summit of the dead skeleton of a Norway Spruce. No shrinking violets, these boys (actually girl in this case). After alerting those of my fellow board members who were handy and showing them the fierce little falcon, I ran around in a manner that was probably suggestive of that John Belushi scene in Animal House, except I darted from monument to monument rather than car to car, trying to sneak up on the bird. She could care less. Fifty feet up and with still warm breakfast, the Merlin had better things to do than worry about the antics of some bipedal clown hiding behind tombstones. Still, I kept a respectful distance. Green Lawn Cemetery in winter. Three hundred and sixty acres, filled with massive trees and jumbo conifers. The place produces good birding year-round, and this is the third winter now that Merlins have returned here. Cemeteries like this somewhat replicate savannas or open taiga - habitats with large overstory trees but sparse vegetation at ground level. This sort of plant structure is what Merlins favor throughout much of their range. There are now Merlins wintering in several of Ohio's large cemeteries, and I will not be surprised if the species is nesting in the state before too long, probably in a large urban cemetery. Here she is, with some hapless songbird clamped tightly in those vice-like talons. If you are looking for this Merlin, tune into the other birds. They may let you know it's around. There's something about seeing one of your compadres snatched out of the blue by a speeding feathered bullet and taken to a prominent perch for all to see, where it is gutted and ripped asunder, that upsets the songbird set. They will scold and utter distressed notes. While not a songbird if we must be accurate here, I noticed the Yellow-bellied Sapsuckers were rather beside themselves. Mewing and squalling, one of them was visibly distraught, over this killer's performance I suppose. A chunk of flesh is separated and wolfed down. I've always had a thing for predatory birds, and what you see above is partly why. Like other raptors, the Merlin is a bird of action. It kills things, and to do so has evolved some very formidable flying skills. Think of the learning curve a young Merlin goes through. This is not like, say, a baby goldfinch. "I say, Sylvester, over here - this is the thistle feeder/sunflower/goldenrod. Now just repeat after daddy whilst I extract these nice little seeds. Good job, little chap, you'll be turning yellow in no time!" The Merlin youth watch parents who resemble feathered Lamborghinis blowing into songbirds hard enough to blast feathers off in a puff of destructive violence. If life persists, the spine is cracked with the powerful bill. Chunks of bleeding meat are sheared from the prey, and the Merlin's bill runs red with gore from Senor Crossbill or whatever was unlucky enough to get caught in the crosshairs. No, this is no goldfinch. Then, the young Merlin must eventually take to the skies and hone the aerial skills that will make it an effective killer of birds. The skill set that must be acquired is a formidable one, and the fact that birds like Merlins can do what they do, and so well, is an endless source of fascination to me. If you are in the Columbus area, I hope that you can get to Green Lawn and perhaps cross paths with our Merlin in residence. Along with Ray Showman and Brian Gara, I made an expedition into southeast Ohio's rugged hill country today. We had a great time, and made many interesting observations and finds, until the snow and ice forced us out. Today brought the worst winter weather yet, and in many areas the roads were ice sheets. But our main targets were lichens, and for the tree-dwelling species at least, snow and winter are not obstacles to observation. They look just fine at this time of year. Along the banks of Handley Branch, a small stream in Lawrence County. The multi-trunked Silver Maple, Acer saccharinum, in the foreground was liberally festooned with lichens, including a very rare species. We walked as much of this habitat as we could before increasing snowfall started us worrying as to whether we'd be able to navigate back out the hilly gravel lane that brought us here. Several factors probably conspire to create an Eden for lichens at this spot. 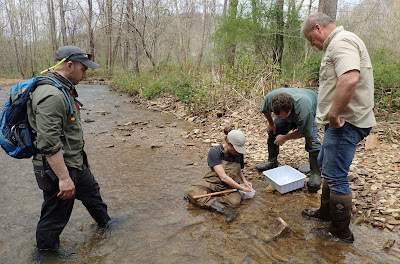 The slight difference in micro-climate caused by the narrow, low-lying stream valley and increased humidity due to water from the creek is one. The Silver Maples seem to provide an excellent substrate for growth. And, maybe, the active presence of that giant paddle-tailed rodent the beaver. I had never tied lichens and beaver together until today. But lichens flourish where there is lots of sunlight penetration, and one of the big, furry fellows had an active slash and skid operation going on here. It's possible that as beavers fell streamside trees and create a more open grovelike situation, the increased sunlight penetration to the remaining timber creates a dreamland for the lichens. At least that's what it looked like and the scattered maples were thickly encrusted. In places where the forest was denser and less beaver-manipulated, lichen abundance dropped noticably. This maple trunk is heavily laden with six or eight species, including the very rare beard lichen Usnea substerilis. This species is new to Ohio and these trees support the only known Ohio population thus far found. Ray, Dan Boone, Jim Decker and I had found it here back in April. Or more accurately, Ray found it and recognized it while the rest of us looked on in semi-ignorant awe. This trunk also supports Green Shield Lichen, Flavoparmelia caparata, Ruffle Lichens, genus Parmotrema, and some species in the genus Hypnotrachyna and Punctelia. And more. In this video, Ray Showman briefly explains the workings of a lichen. They are fascinating organisms, the result of a pairing between an alga and a fungus. The fauna associated with lichens is poorly known, and if someone wanted to describe new species of insects they'd probably do well to study lichens. Who knows what all creatures have evolved a specialized lifestyle attached to lichens. There is no doubt that lichens are often heavy in bugs, and bark-creeping birds pick through them seeking prey. This is Bushy Beard Lichen, Usnea strigosa, one of three species in this distinctive genus at the Lawrence County site. The specimen in the above photo is in reproductive mode; it sports apothecia, or fruiting bodies. They are the slightly concave round appendages, two of which are especially prominent at the bottom of the lichen. This is the heavy hitter, Usnea substerilis, of which this specimen and the others at the site - about a dozen in all - make for the first Ohio record. There is no question that lichens are obscure and overlooked. Few people seek them out, and few people can identify them. However, there have been enough authorities looking around the state over the decades to paint a somewhat accurate picture of their status. And these beard lichens are among the most conspicuous of the group, and with only ten or so species to be concerned with in these parts, it's not like one will be overloaded trying to master Usnea. Yet no one had reported this one. I suspect it will prove to be a localized rarity, but I'd bet other populations await discovery. Indeed, while driving back we passed along a very similar habitat, and a quick scan of some large creekside trees through binoculars revealed more beard lichens. By then, it was snowing pretty good and the roads were skating rinks so we forged ahead. I'm sure Ray will be back there next year, though, and add to our database of lichen knowledge. The chittering horde has arrived. Bedecked in pinks and greens, with bill tips crossed over as if torqued with a pair of vice-grips, the White-winged Crossbills have invaded Ohio. No one is complaining. Indeed, few winter finches cause the stir amongst birders that crossbills do. Doesn't matter if they are White-winged or Red (we've had a few of the latter, too) - either species is exciting. Of course, the Reds bring their own set of problems. It seems as if there are eight "types", someday to be species? If these entities are ever foolishly split, and suddenly we've got eight "species" of Red Crossbill roaming the landscape, crossbill madness will ensue among the listers and all sorts of crossbill experts will arise from the mire of dubious taxonomic decisionry. Have fun, bird records committees. But that's another story. 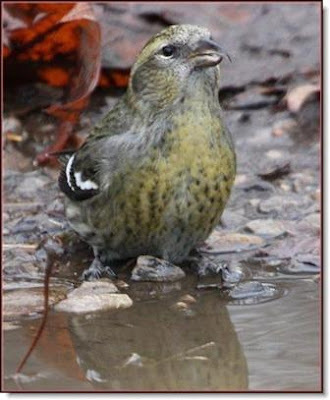 Yesterday, Aaron Boone found one White-winged Crossbill at Green Lawn Cemetery in Columbus. Today, Bernie Master found about three dozen there. I suspect they all came in today, as an increasing number of crossbills sweeps south of the Great Lakes from their boreal forest haunts. Bernie took this outstanding photo of a female attacking the cone of an Eastern Hemlock, and the photos that follow. The mandible tips of crossbill's bills do just what the name says: they cross. These contorted beaks enable the birds to more effectively pop the scales from the cones of conifers and get at the seed sheltered within. They no doubt play a vital role in the ecology of the vast boreal forest in terms of dispersing the fruit of spruce, fir, larch, hemlock, and pine. In the scheme of things, the conifer-dominated northern forests are quite young, much of the area that they occupy having been steamrolled by glaciation some 10,000 years ago. Thus, the crossbills are still assorting themselves and actively evolving as they nomadically exploit the various species of cone-bearing trees. Think Darwin's Finches of the north. Conifer fruit varies greatly, from the dainty little cones of hemlocks to the massive mini-pineapples produced by White Pine. So, the crossbills - Reds in particular - are hard at work evolving a bill for all sizes. Compounding the madness is that all conifer species are cyclical in their cone production - lean year, lean year, boom year, lean year - or similar cycles. This probably accounts for the nomadic wanderings of crossbills, and their occasional en masse peregrinations to the south. A further wrench in our understanding of how all this works is that the same species of conifer might have boom production in one part of its range, and bust production in another. An awesome shot by Dr. Master. We can all only wish we had been there. 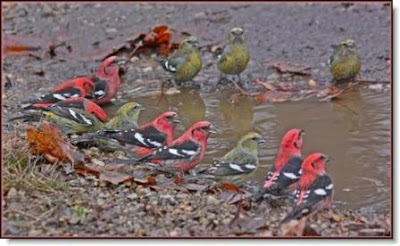 A parcel of crossbills descended to a puddle to bath, and probably take grit. The males are a rather extraordinary pinkish hue, especially when young - in my opinion, not only the showiest of the crossbills, but one of the best-looking North American passerines. They are great fun to watch. Social in the extreme, crossbills are often very tame and allow close approach. They remind me of little parrots as they clamber about the branches, tearing cone scales off and sometimes using their bills to help pull themselves about. Crossbills are talkers, too. Non-feeding flocks emit a constant twittering, and that's how most of them are detected initially. Be aware, though - intensely feeding birds are often silent, the only sound being created is that of the pop and rip of cone scales being shucked, along with the visual of little cone shards drifting down from above. This female is allowing us a close view of her crossed mandible tips. A great shot by Bernie here. They give their beaks a workout. One bird can allegedly dig out and eat a few thousand seeds a day. Imagine what several dozen birds might do to a stand of hemlock. Multiply all of the crossbills throughout the boreal forest and it is easy to see why they play such an integral role in northern forest ecology. The individual above displays the least commonly seen type of White-winged Crossbill bill. The lower tip crosses under the upper to the left in this bird. Probably 2/3rds of White-winged Crossbills have the opposite arrangement - lower crosses to the right. Beautiful map by Ethan Kistler of the White-winged Crossbill situation to date in Ohio, but I suspect Ethan will be making regular updates to the map. Looks like over 300 birds reported thus far, and they'll be many more to come, I'm sure. We haven't had an invasion like this for some time. If you've got a park or cemetery nearby with lots - or even a few - big ornamental conifers, especially hemlock, go check it out. You might be rewarded with some of these parrotlike pink crossbills.